Definition at line 466 of file shellclasses.h. Definition at line 468 of file shellclasses.h. Definition at line 484 of file shellclasses.h. Definition at line 485 of file shellclasses.h. Definition at line 473 of file shellclasses.h. Definition at line 487 of file shellclasses.h. 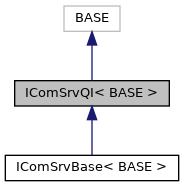 Referenced by IComSrvQI< IEnumFORMATETC >::QueryInterface().